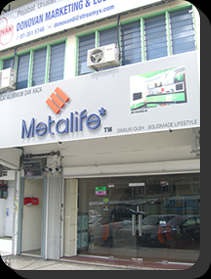 Metalife has commenced business since 2007, is specialized in all aspects of glass and aluminium material for all commercial and commercial used. We provide the very best value in all architectural, glass, aluminium works, Shop Front Glass Partition, Folding Doors, Milky Glass, Sliding Doors, Swing and Slide System, aluminium Fabrication. With our diverse portfolio of products we can offer Customize Solutions to all your design requirements & specifications. Metalife's staff are able to provide you with engineering, drafting, estimating and designing of aluminium and glass product and they are trained to ensure that all aspects of a project are given the necessary attention and treatment. Every aspect of the objectives and criteria set by consultants and developers will be thoroughly considered and efficiently incorporated into the design. We're pleasure to provide you with the excellent service, pls feel free to contact us.